The post top retrofit lamp is a convenient, easy to install LED solution for acorn fixtures, globe fixtures, and some bollards. MaxLED’s retrofit lamp utilizes premium components to ensure reliable performance in a variety of applications. 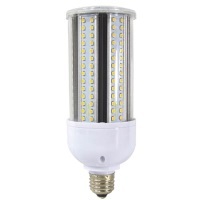 The Post Top retrofit lamp offers improved quality of light compared to traditional high pressure sodium and metal halide lamps.